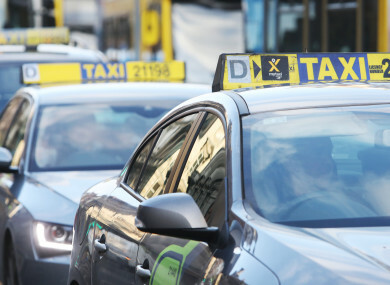 DUBLIN TAXI DRIVERS have been receiving complaints from people with disabilities and tourists visiting the city because of restrictions put in place in the last year. Tony Rowe, chairman of the National Transport Assembly of Ireland, and a taxi driver in the capital himself, has said the restrictions around College Green and the removal of over a dozen taxi ranks has negatively impacted on the service. He said Dublin still has more taxis than any other European Capital, but drivers have “abandoned the city centre, especially around the Grafton Street and Dawson Street areas” due to the restrictions. Rowe said bringing a customer to destinations in those areas now takes much longer and in many cases drivers can not bring them right to the door because of the restrictions. A ban on taxis travelling southbound in the College Green area in peak times was introduced earlier this year to address traffic congestion following the launch of the Luas Cross City. Rowe said 18 taxi ranks have also been taken out of circulation, which means drivers have few places in the city centre to use as a base to collect people. He said his organisation was recently contacted about a wheelchair user who regularly uses taxis to bring her from her house into a bookshop in the city centre to meet friends for a cup of tea. “She had to be dumped out at Grafton Street in the rain because the driver couldn’t bring her down, he was banned from going into the College Green area at that time of the day,” he said. He said the lack of ranks combined with these restrictions are also “making us a laughing stock” among tourists. “Tourists are contacting us in large numbers saying they can’t get taxis in town, all the ranks are gone. There are lots of elderly tourists and now it’s hard to drop them right to their hotels, sometimes they have to be dropped with their luggage and walk. Rowe said he has asked Dublin City Council to work with taxi drivers on the issue and has put forward proposals for new taxi rank locations in the city. Email “Taxi drivers say Dublin city restrictions are hindering transport for people with disabilities ”. Feedback on “Taxi drivers say Dublin city restrictions are hindering transport for people with disabilities ”.